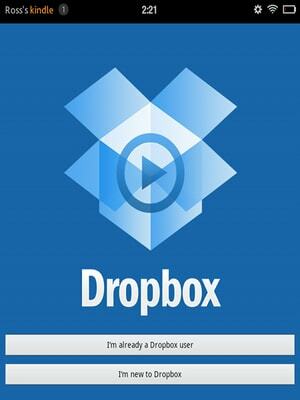 How to install Dropbox on Kindle Fire. A lot of people can’t live without Dropbox these days. And why shouldn’t you be able to access all your important files wherever you are; at home, at work, on your phone or on your Kindle Fire. The lack of hard storage has been an issue with the Kindle Fire but it doesn’t have to be. The DropBox app isn’t available in the Amazon App Store, but you can still install Dropbox on Kindle Fire and sync dropbox on kindle fire. Follow the step by step instructions to get Dropbox on your Kindle Fire. 1. From the Kindle Fire’s main screen, tap the gear icon (next to the clock). 2. Tap “More” and then “Device”. 5. Download the Dropbox Android app.The app downloads quite quickly, so you may think nothing’s happening when but it’s already downloaded. 6. You should have the Dropbox .apk file after downloading. 7. When the download is finished, you will see a notification in the top left corner. Tap the notifications next to your Kindle Fire name and then tap Dropbox.apk. 8. Click the prompt button to install the application. 9. When the installation is complete, start the Dropbox app and log in. Great info – thanks – I did it!! I followed the directions yet each time the fire hd 7 directs me to the amazon app store and then does not allow me to download the app. I do not have a lap/desk top to circumvent the problem. Any ideas? I figured it out. I was using Firefox as a browser and not silk. Silk let me do the download.